circa 1000-2000 BCE: Petroglyphs along the Pegtymel River which drains into the Arctic Ocean in north eastern Siberia "depict anthropomorphic figures with mushrooms appended to their heads. "2 The Pegtymel river area is currently inhabited by the modern Chukchi culture who are known to have used A. muscaria as a traditional inebriant. 500-0 BCE: Rg Veda hymns, a set of sacred stories from India, include mentions of a magical intoxicant called Soma. In 1968, R. Gordon Wasson published the controversial book Soma: Divine Mushroom of Immortality, speculating that Soma refers to Amanita muscaria. 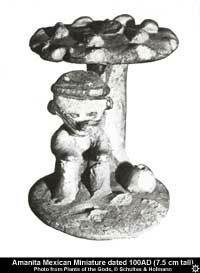 100 AD: 7.5 cm high miniature statue of an Amanita muscaria dated to 100 AD found in Nayarit, Mexico, suggests A. muscaria may have been in use in coastal Mexico. Many other sculptures from Central and South America depict the ritual use of other psychoactive plants and mushrooms. Of all Swedish plants, however, I consider the Fly-Agaric, Agaricus muscarius, to be the one which really solves the mystery of the Beserks. Its use is so widespread in Northern Asia that there are hardly any nomadic tribes that do not use it in order to deprive themselves of their feelings and senses that may enjoy the animal pleasure of escaping the salutary bonds of reason... Those who use this mushroom first become merry, so that they sing, shout, etc., then it attacks the functions of the brain and they have the sensation of becoming very big and strong; the frenzy increases and is accompanied by unusual energy and convulsive movements. The sober persons in their company often have to watch them to see that they do no violence to themselves or others. The raving lasts 12 hours, more or less. 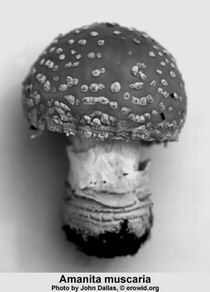 circa 1960-1965: A. muscaria use appears in United States urban subcultures, but remains rare because many users report the effects to be unpleasant. 1978: A Native American author, Keewaydinoquay, writes of the traditional use of A. muscaria by the Ahnishinaubeg (Ojibway) people who live near Lake Superior in North America. Although this use is assumed to be quite old, the earliest documented use is from the 20th Century. Wasson RG. Soma: Divine Mushroom of Immortality. 1968. Schultes RE, Hofmann A. Plants of the Gods, 1992, page 82. Odman Samuel. 1784 "An attempt to explain the Beserk-raging of Ancient Nordic Warriors through Natural History". Keewaydinoquay 1978 "Puhpohwee for the People: A Narrative Account of Some Used of Gungi Among the Ahnishinaubeg", Ott, Pharmacotheon pg 333 , & NAVET E., 1988, Les Ojibway et l'Amanite tue-mouche (Amanita muscaria). Pour une éthnomycologie des Indiens d'Amérique du Nord, J.Soc.Améric., 74:163-180. But it is difficult to imagine that the artist would have no awareness of the similarity of the common fly agaric and the strange, un-treelike, mushroom-shaped sprouts. 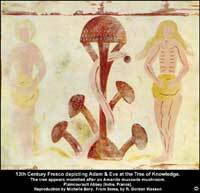 There is no evidence, however, that this fresco indicates any human use of A. muscaria.